Device Unlock is an Android app that allows you to request and apply a mobile device unlock directly from the device. This allows you to automatically apply Mobile Device Unlock to the device without using a manual code. When your phone is locked with “Mobile Device Unlock” it’s totally useless to order an unlock code. Only supported devices (see below) may download the app or have it pre-installed. 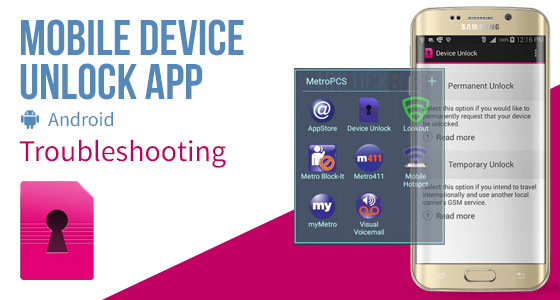 Supported devices may download the app from: Google Play. It’s very important to order the unlock service of your Cell Phone using the correct service. Check that you have an active data connection. Check that the device memory is properly managed. Restart the device and try again. Device not recognized by your service provider. Please call customer care. Data corrupted during transfer. Please try again.Error during data transfer. Please try again. Server not responding. Please try again later. Failure in processing the request. Please reboot device and try again. Solution 1: Perform a hard reset and attempt a second unlock. Solution 2: Perform 2 consecutive hard reset without attempting the unlock and once the second hard reset has been performed attempt the unlock again. Make sure phone has latest Android version available for that device. No internet connection available. Please try again when internet connection is available. Device is not connected to 3G/4G LTE. Unable to connect to the server at this time. Please try back again later. Attempt the unlock using the mobile network. Unlock Failed: This mobile wireless device is not eligible for unlock. For Device Unlock eligibility details, please go online or contact Customer Care. Unlock Failed : System maintenance error, try again later. Failure in applying the unlock settings. Please try again. Disconnect from Wi-Fi and try again. Make sure you use the original Stock ROM (no custom Firmware like CyanogenMod, or Unbranded ROM). Make sure you’re using the latest version of Firmware for your Cell Phone. Finally (after upgrade) perform a Hard Reset on your Cell Phone. Turn off 3G/LTE and force the use of a local WiFi Hotspot. Make sure you use home Wifi (and not a public/company WiFi since they might limit somehow your internet usage).